I have been dry brushing my body religiously, twice a day for months now. I have to say I wasn’t really sold on the idea being that I already use a body scrub and loofah in the shower, I just didn’t see what the benefit would be. After more thorough research, I caved and decided to really give it a shot to see if there was any difference. After about a month I did notice that my skin had become even softer. My body cream is also more easily absorbed than before, not to mention the more even tone to my skin. Now just to clarify, this is not something that is recommended for your face. This should be a body treatment only. So why dry brush? Dry brushing is a most excellent way to exfoliate. Your skin is a complex system made up of nerves, glands, and cell layers that, when healthy, serves as a buffer that helps protect your body from extreme temperatures and chemicals. Your skin also supports detoxification. However, if your skin is laden with toxins and dead skin cells, it will not be able to eliminate wastes from your body efficiently. This is where dry skin brushing makes sense. Not only will this treatment effectively remove dead skin cells, it will also activate waste removal via your lymph nodes. There are currently studies that are being performed in regards to dry brushing helping to prevent certain types of cancers. So let’s start with the basics of how to do this. 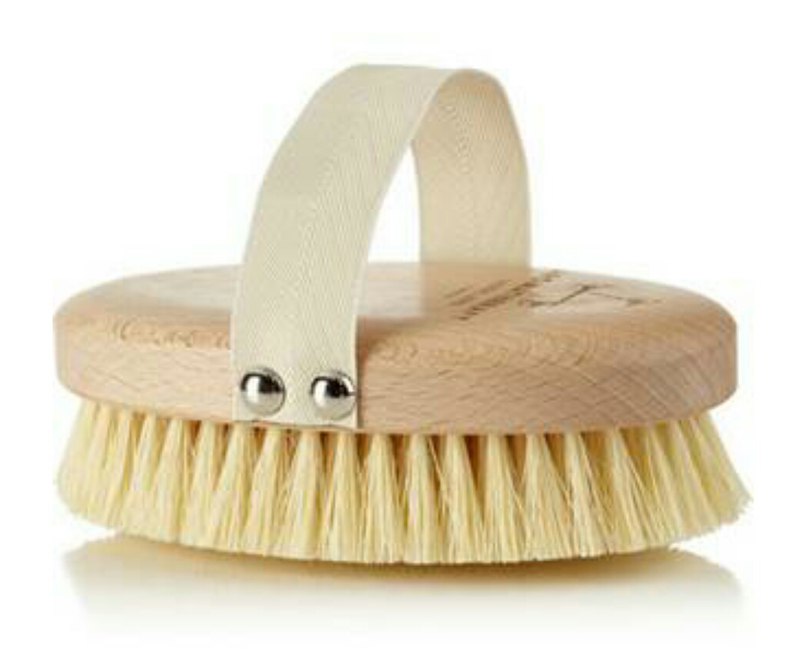 First, you will need a body brush, one like the one pictured above or one with a handle. You want natural bristles, firm but not overly so, not synthetic bristles. It should say on the packaging what material it is made of. You want to do this obviously when your skin is dry and, the brush also needs to be dry. You want to start brushing, starting at the soles of your feet and work your way up. Always brush towards your heart. You want to use long, firm strokes. Do not by any means brush so hard that your skin becomes raw, but you want to do it hard enough so that your skin is pink, like you have a slight sunburn. I recommend doing it in your bathtub or shower to contain all the dead skin cells. If you have good lighting in your bathroom like I do, you will be able to see all the dead skin flaking off. I exfoliate regularly, and was so surprised at how much dead skin was coming off. So as far as exfoliating goes, this is my new method. Afterwards, just take a regular shower, then moisturize. The next day you will wake up with baby soft skin. There are days that I only do this once depending on how fast I need to get ready in the morning, but the general consensus is doing it morning and night will provide maximum benefit, since your skin builds up dead cells constantly. So I am completely sold on dry brushing, have you tried it? I haven’t tried this before, but it sounds interesting! I love it! It really is invigorating. My skin feels tingly after, like a detox mud treatment! This is really interesting. Is it something you would or wouldn’t recommend for certain skin type or would you say it is for everyone? Where can I get a brush? If you have a skin condition such as eczema I would use extra caution, it would be the same for chronically dry skin. Like with all new treatments you should do a test run and not overdo it the first few times, especially if you have sensitive skin. The brush I got was at Ulta. You can find them most everywhere, like target, or a drugstore. Mine was 8 dollars! I do plan to get rid of mine after several months and start over with a new one. The bristles will soften, clog, and become less effective. You could sanitize, but the bristles will still lose their firmness being that they are natural. Let me know if you try it, and what you think!